Darwin's Cove and Naturalist Center provides a bounty of information on the destination, wildlife, and environmental efforts. 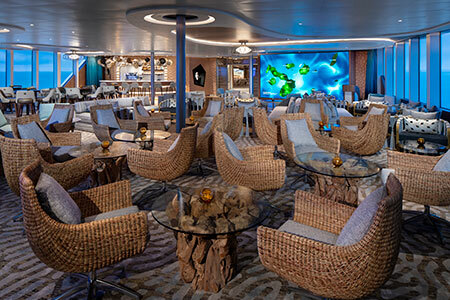 The Discovery Lounge is the hub of onboard activity where you'll enjoy presentations from Celebrity's team of Naturalists and will help you create a personalized experience in the islands. This is also the place to socialize - there's a full bar and a stage for entertainment. The Marina on Deck 3 is the primary point of access to the ship and can accommodate up to three Zodiacs at once, reducing transport time to and from land and allowing more time for guests to explore the Galapagos islands. Want to learn even more about the Galapagos? Head up to the Observatory - the stunning library is dedicated to the Galapagos Islands. Theres no better place to cozy up with a book and take in the views from the floor-to-ceiling windows. 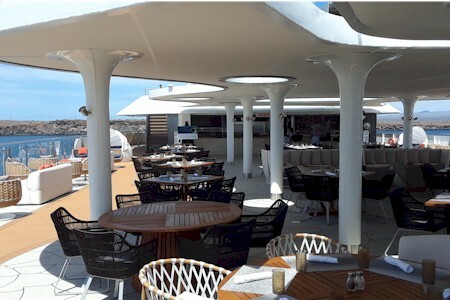 Ocean Grill is an outdoor casual dining space that offers panoramic views during the day and stunning, starlit skies at night. From grilling up the highest quality sustainable seafood for lunch, to the spectacular Dinner Under the Stars, Ocean Grill is the envy of any destination restaurant - on land or at sea. Celebrity's Michelin-starred chef crafts menus that use the freshet, local ingredients and highest quality, sustainable seafood. Breakfast, lunch, and dinner are served daily in this upscale restaurant. 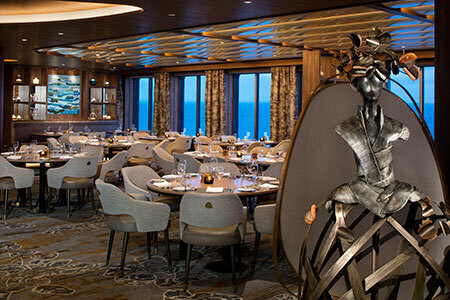 This spacious restaurant features floor-to-ceiling windows throughout offering stunning views. In the Fitness Center, enjoy state-of-the-art exercise equipment or schedule a relaxing (and therapeutic) massage in the Spa. The stars in the night sky over the Galapagos Islands are a brilliant sight to see. And, theres no better place to witness these celestial marvels than on the Stargazing Platform. You can participate in a guided astronomy tour or enjoy star-lit skies on your own. 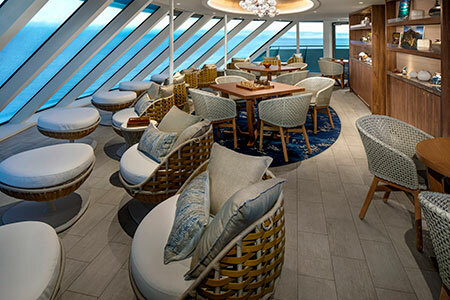 After a full day exploring the Galapagos, unwind in the Sunset Lounge. With floor-to-ceiling windows, it is an ideal place to enjoy a cocktail, relax, and share stories with others. This open-air hideaway is the ultimate place for unwinding. Sip in the hot tub for a soothing soak. 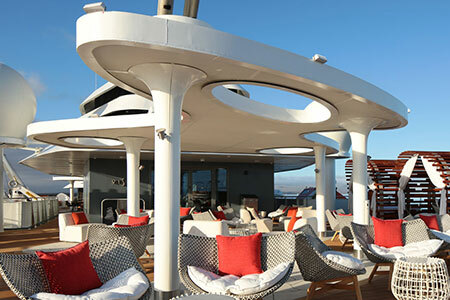 Or sink into a cocoon-style lounger, or head to a cabana to enjoy cocktails with friends. It is a great spot to watch the sunrise and the sunset.